Queensrÿche is an American heavy metal band formed in 1982 in Bellevue, Washington, out of the local band the Mob. The band has released 14 studio albums, one EP and several DVDs, and continues to tour and record. The original lineup consisted of vocalist Geoff Tate, guitarists Chris DeGarmo and Michael Wilton, bassist Eddie Jackson and drummer Scott Rockenfield. Queensrÿche has sold over 20 million albums worldwide, including over 6 million albums in the United States. The band received worldwide acclaim after the release of their 1988 album Operation: Mindcrime, which is often considered one of the greatest heavy metal concept albums of all time. Their follow-up release, Empire, released in 1990, was also very successful and included the hit single „Silent Lucidity“. The band has received three Grammy Award nominations for songs off both albums. In 1998, drummer Rockenfield received an individual Grammy nomination. In 1997, guitarist and primary songwriter DeGarmo left the band for personal reasons. Over the years, his replacements have been Kelly Gray, Mike Stone, and Parker Lundgren, respectively. Following a highly publicized backstage altercation before a show in São Paulo, Brazil, in April 2012, Tate was fired from the band and replaced with then-Crimson Glory singer Todd La Torre. In response to his dismissal, Tate and his wife Susan (who served as the band’s manager from 2005–2012) filed a lawsuit in a Washington court, claiming that he was wrongfully terminated. The ruling in the preliminary injunction was that both parties were allowed to use the name Queensrÿche until a court ruling or a settlement decides who gets to use the name. A settlement was reached on April 17, 2014, in which founding members Wilton, Rockenfield and Jackson were awarded the rights to the band trademark, continuing to play with the lineup that additionally includes singer La Torre and guitarist Lundgren. During the time both parties could use the name Queensrÿche, Tate created his own lineup featuring former guitarist Gray and musicians from bands including Blue Öyster Cult, Ozzy Osbourne, Whitesnake, Dio, AC/DC and Quiet Riot. 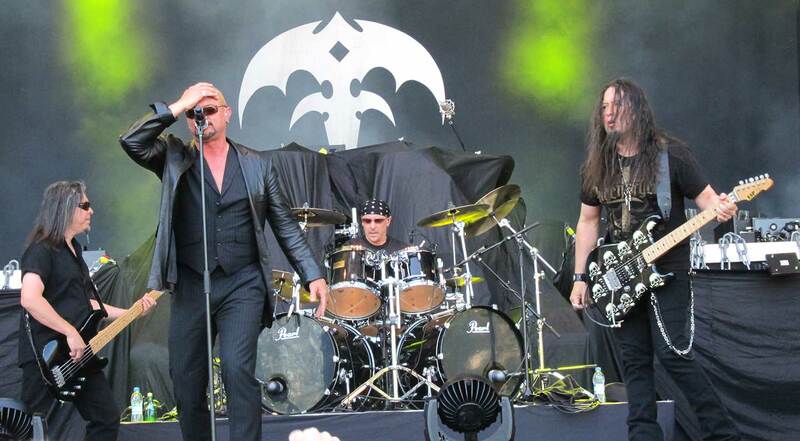 This version of Queensrÿche with Geoff Tate released the album Frequency Unknown on 23 April 2013, while Queensrÿche (with La Torre replacing Tate) released their eponymous album on 24 and 25 June 2013 (European and American release date, respectively). Both bands toured in 2013 and 2014.